It seems so simple, delight your customers and you gain a couple of ambassadors for your brand who will try to convince all of their friends to become a costumers for your brand. Still it proofs to be really difficult for so many companies to do the right thing for their costumer. The first step, signing a new customer up, is usually not a problem, however, as soon as the potential client has become a costumer, the great service stops. A badly treated customer can easily become a brand terrorist, especially in the age of the Internet and Social Media! You would think I should take this problem to Twitter, so I tried to look up the official Bank of America Twitter account to blast an unfriendly message from an unhappy customer into the Twitter stream, hoping my problem would be resolved with one snip of the fingers. Not..! Just check the profile, only 5 other accounts being followed, and 0 tweets! @BofA_TipsWe provide information to help you get the most from your money with tips on shopping, travel and personal finance solutions. 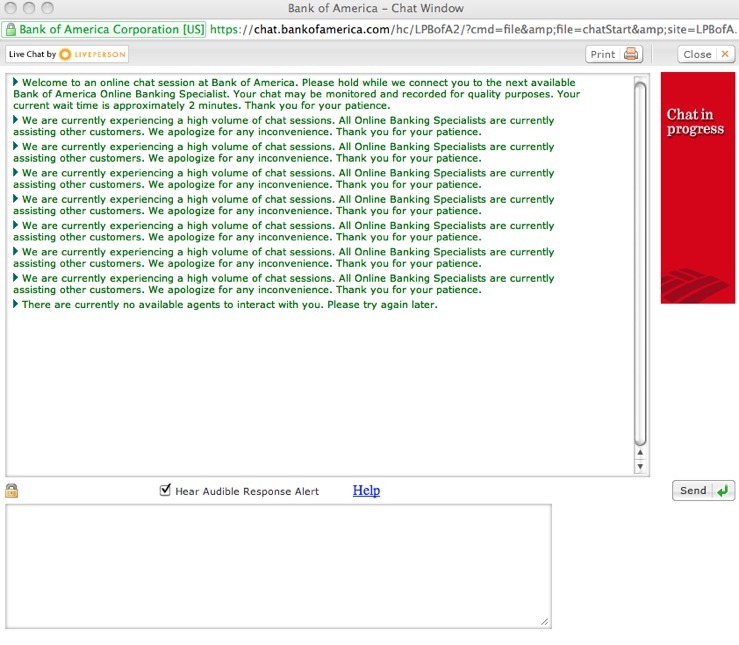 @BofA_HelpWe are official Bank of America Twitter reps, here to help, listen & learn from our customers. Tweet with Bank of America reps 8-8 ET Mon-Fri.
@BofA_CareersBofA_Careers is where you can stay connected to featured job opportunities at Bank of America. 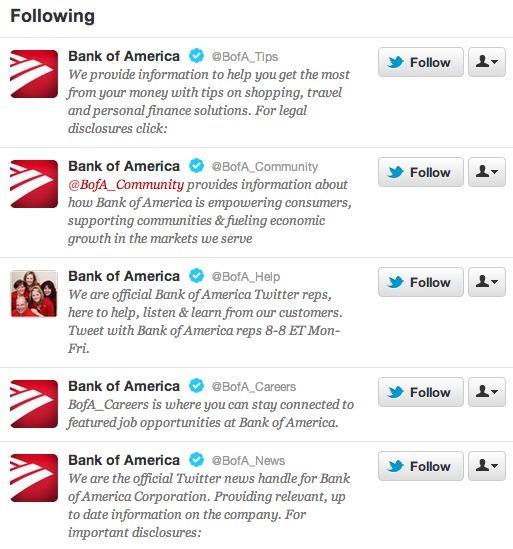 @BofA_NewsWe are the official Twitter news handle for Bank of America Corporation. Providing relevant, up to date information on the company. It looks like the Bank of America Help Twitter account has six enthusiastic customer service reps on staff for just 12 hours a day. However, my experience with the help through Twitter has not always been that successful. It always starts out great, “hey, we are happy to help you, please follow us, DM your information.” But what happens next after that? I’m sure that the nice 6 people of the BofA_help twitter account work around the 12 hours to help people with their banking problems. Me, I’m walking into a branch tomorrow and will ask the people there to help me.